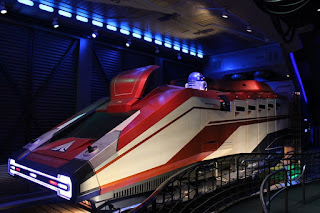 Since my first trip aboard a Starspeeder 3000, I have been in love with Star Tours. Maybe it was flying along and “assisting” in blowing up a Death Star, I say assist because my armrests were controls and I was a snubfighter ace even in a transport ship. Maybe it was how real, dirty, and lived in everything from the launch bay to icy comet felt to me. Maybe, after a long love affair with Threepio and Artoo, it was having a new droid to love in Rex. Whatever the reason, or culmination of reasons, I loved Star Tours from the minute I rounded the corner and saw the AT-AT looming large on the horizon. Fast-forward to Star Tours – The Adventures Continue, and the prospect of visiting new worlds in a choose-your-own-adventure style attraction, except the computer is choosing the adventure not the guests, and I was geared up with excitement. The thoughts of seeing Hoth and Tatooine, facing off against Vader and Boba Fett, and having a holographic Leia tell me I was her only hope made my inner child giddy, and one or two of the scenes may have brought a tear to my eye. The mix and match interplay between the two trilogies never seemed to put me off too much, as a fair portion of the scenes didn’t rely heavily on what was happening or where we were in the timeline. Maybe a jump from Hoth to Coruscant seemed a bit jarring, but only for a second. Everyone has their favorite scenes and eras of Star Wars, that’s what makes the galaxy far, far away so expansive. When news broke earlier this week that the algorithm for selecting locations would start aligning within eras, the news hit me in sort of an odd way. I understand that three lines, with dedicated lines for the prequels, original, and the modern trilogies, would be a mess and something that neither Disneyland nor Disney’s Hollywood Studios’ versions of the attractions have the capacity to take on. The news that the prequels and original sections would be paired together as a single line, with the current trilogy being given a separate queue, brought the stark realization to me that there are very few scenes of the current Star Tours attached to the original trilogy. My first thought was that Star Tours needs more scenes and more locations to visit from the original trilogy, destinations such as Bespin, Dagobah, Yavin IV, and Endor. By this point, however, my inner-child started drifting off into blue sky land and made some valid points. What made the original Star Tours great in my mind, regardless of the fact that it contained the same adventure over and over again, was that it was a self-contained story unto itself. There was an arch to the story. Sure, the argument could be made that the current iteration of that attraction does this with the inclusion of the Rebel Spy through line, but it only feels connected by the most tenuous thread to me. What if, my inner child pondered, you didn’t know which adventure you were going on, but that it was a fully fleshed out adventure in and of its own rights? Such as coming under assault on your way into Bespin and have to divert through some of the mining operations we’ve never seen, escaping Separatists on Coruscant by delving deep into the lower levels of the city-planet, help take out the shield gate in the Battle of Scarif, or even engaging the First Order head on over Starkiller Base? Throw guests into a fully fleshed out chapter of a Star Wars story, not just nibble around the edges. The mystery element would still be intact as you board, but once your journey was underway it wasn't a bouncing between different elements, it was a single story. With more time to advance the individual tale, more elements, characters, and nods to the films could be included. Plus, it would feel like a real adventure, not just blips of coming attractions or whiplash travel ads. While these are just the daydreams of the boy-Jedi still living inside of me, I think they’re questions worth asking. As always, I greet new Star Wars experiences with open arms, but I’m always thinking of what could be or what might have been. The transition to dedicated experiences is one I look forward to, though I worry about how long lines for the latest addition will impact the ability to visit locations pivotal to the adventures we embraced growing up. Only time will tell. Meanwhile, I have some more daydreams of Dagobah to get back to!